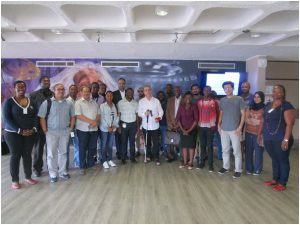 Dr Nasar Ali and Professor Jean Ebothe representatives of NANOSMAT Steering Committee went on an official visit to the iThemba Labs based in Cape Town, South Africa (during January 2017) on the invitation by National Research Foundation of South Africa (NRF). Professor Maaza Malik was the chief host who is the UNESCO UNISA Africa Chair in Nanosciences & Nanotechnology, South Africa. 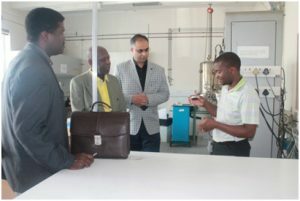 Dr Ali and Professor Ebothe each gave a seminar and were shown around the facilities of iThemba Labs. Activities at iThemba LABS are based around a number of sub-atomic particle accelerators. The largest of these, a k-200 separated sector cyclotron, accelerates protons to energies of 200MeV, and heavier particles to much higher energies. Smaller accelerators at the Western Cape site are two injector cyclotrons, one providing intense beams of light ions, and the other, beams of polarized light ions or heavy ions, and a 6MV Van de Graaff electrostatic accelerator. Accelerators at the Gauteng site include a 6MV tandem Van de Graaff electrostatic accelerator and two low energy electrostatic accelerators for ion implantation and other surface science studies. iThemba LABS brings together scientists working in the physical, medical and biological sciences. The facilities provide opportunities for modern research, advanced education, the treatment of cancers, and the production of unique radioisotopes. The focus is on providing scientifically and medically useful radiation through the acceleration of charged particles using the Separated Sector Cyclotron, the Van der Graaff Accelerator and other appropriate technologies. iThemba LABS is to be the primary center of expertise in radiation medicine and nuclear science and technologies to advance the knowledge and health of the people of Africa. Furthermore, the foundations to ignite the first ever NANOSMAT-Africa during late 2018 were laid down. Once the details are confirmed we will be announcing the news officially in the Nano World magazine/website. A group photo take outside the seminar room at iThemba Labs, Cape Town (South Africa). Professor Maaza Malik (the host) can be seen in the centre of the picture (with a walking stick). Professor Jean Ebothe & Dr Nasar Ali visited the Material Research Department (MRD) facilities. The head of MRD Dr Mlungisi Nkosi can be seen on the right talking to his guests. Dr Sone (first on the left) can be seen in the photo.